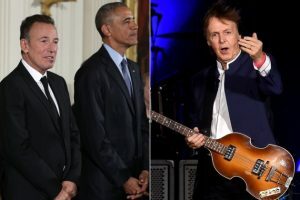 President Barack Obama will reportedly close out his second term with what’s being described as a “grown-up” party, set to be hosted at the White House on Jan. 6 with a star-studded guest list that’s rumored to include Bruce Springsteen, Paul McCartney, Eddie Vedder and many others. The Washington Post reports that, per this administration’s tradition, the Obamas will foot the bill for the party themselves — and those who don’t make the “close friends and major donors” cut described by NME shouldn’t plan on seeing any cellphone footage, as personal communication devices will reportedly be confiscated at the door. Nothing’s been officially announced by the White House yet, but Chance the Rapper seemed to confirm his presence on the guest list with a tweet telling followers he was heading to D.C. for a fond farewell to the President.